A woman was airlifted to hospital after the motorcycle she was riding was involved in a collision with a bus. 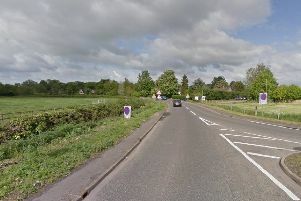 The crash took place on the A141 near RAF Wyton at 9.15am yesterday, Thursday May 25. The Magpas air ambulance landed at the scene and took the female rider to Addenbrooke’s Hospital with multiple serious injuries. Nobody else was injured in the crash, which closed the road between the B1090 Sawtry Way and Ramsey Road at Old Hurst for several hours while a collision investigation was carried out by police and the vehicles were recovered.